Architect Adam Gross, of Ayers Saint Gross, shows drawings for the proposed new Building G at Arsenal Yards. It would be a lab/office space for biotech companies. Looking to take advantage of one of the hottest industries in the Boston area, the developers of Arsenal Yards seek to turn the previous proposed residential tower into a biotech research and development lab and office building. Last week, representatives from Boylston Properties presented their preliminary plans for Building G — the last piece of the Arsenal Yards project — during a community meeting. 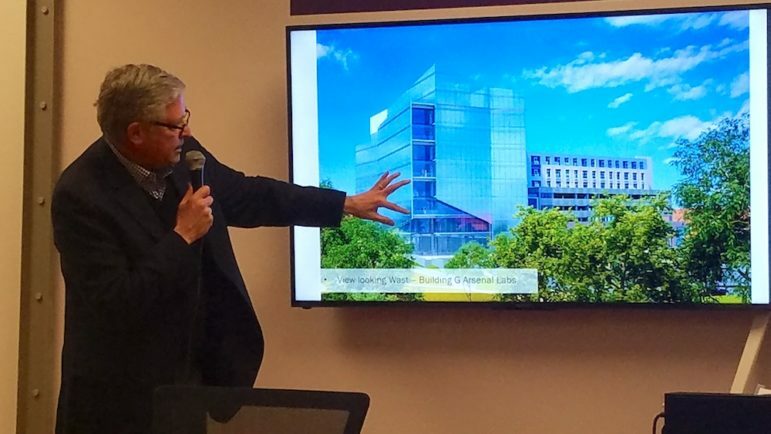 Biotech has already made significant inroads in Watertown, with 23 companies employing about 1,500 people, said Andrew Copelotti, a principal at Boylston Properties. “Watertown is becoming known as a desirable address for the innovation economy — for clusters such as life sciences,” Copelotti said. That was the reason for changing Building G from a residential tower to a biotech lab and office space. “One-Hundred-and-thirty feet (tall) did not make sense as a residential building,” Copelotti said, adding that — at 155,000 sq. ft. — the floor area as an R&D facility will be 33,000 sq. ft. smaller than if it had been a residential building. A side look a the floor plan for Building G at Arsenal Yards. The proposed nine-story building would be widest on the second and third floors, with a slightly smaller, glassy lobby/common area. The fourth through eighth floor would “step back” and the ninth floor would be an even smaller penthouse level, said architect Adam Gross of Baltimore-based Ayers Saint Gross. There would also be one level of underground parking beneath the building with more than 50 spaces, Copelotti said. The side facing the Charles River — the south side — will be glassy, while the north facade will be largely masonry, which sits next to another building in the Arsenal Yards project that includes a few floors of apartments, said Boylston Properties Principal Bill McQuillan. “If you are in the residential building, you don’t want to be looking at office people, or have office people looking at them,” McQuillan said. Every floor will have a balcony, which will alternate east facing and west facing as the floors go up, Gross said. Some at the community meeting asked if Arsenal Yards would be providing any space where the general public could go inside the building. One resident noted that in Kendall Square, some buildings have exhibition space on the ground floor. Town Council President Mark Sideris agreed. Jeffrey Brown, who is on the Planning Board, said that a community space could provide a link between the residents and the companies in the building. McQuillan said typically, the public would not be walking through the lobby of an R&D building. Gross said he could look into options for creating some kind of space that is accessible to the public. Models of what Building G would look like on the Arsenal Yards property. On the left the whole area is shown, including Arsenal Park and the Charles River below the development. On the right, a close up of Building G in the foreground with Building F behind and to the left. Residents worried about how the new building will fit with Arsenal Park, which sits just over a dozen feet from the west side of the proposed building. McQuillan said he will work with the Town to make the area attractive. Right now the park ends at a fence, with a significant drop to the service road behind the mall. Some worried about the loss of trees, especially in the area of path leading from the Arsenal Yards property down to Greenough Boulevard next to the Charles River. Steve Woods, the landscape architect from CRJA-IBI Group, said that the paths have been redesigned so that fewer trees would be removed compared to the original design. Another resident worried that the light from the building would shine onto the nearby Charles River at night, especially because of the long hours often put in by biotech workers. Gross said some of the light can be dampened by having special glass, but said it would likely be lit at night. Construction has moved ahead steadily, and the Wilder Cos., which is managing the retail side of the new project, has already had success filling the retail spots in the new project, Copelotti said. Arsenal Yards’ big parking garage, with more than 700 spaces, is going up on what was the main parking lot of the old mall. It should be completed by June, Copelotti said. The Majestic Cinema and City Works restaurant are expected to open in the fall. As for Building G, that remains to be approved by the Planning Board. McQuillan said that it will be another two to three months before it is heard by the Planning Board. That would mean the construction would not likely begin until late 2019 or early 2020. The building would be finished in 2022, he said. For those who are interested. A walk along the new parking garage of 5 ish stories will give you a sense of what walking along Arsenal Street will feel like after the new 5+ story residence and hotel are constructed. The new area will be better landscaped but the height will be the same or greater. I don’t understand why the tallest structure in this development should be the closest to the river. Since the usage has now shifted to biotech and laboratories, views from the windows are hardly an issue. Shouldn’t this structure be closer to Arsenal Street? It could end up that the structures closer to Arsenal Street will also increase in size. It is obvious at this point that the current plan is not what was original proposed and there is no evidence that the plan will not continue to change even further down the line. It is unfortunate though that such a large structure is this close to the river. The current zoning rules have no provision for location restrictions. The planning board could have addressed this when they gave approval for the special district. Since this is a change from the original approval the planning department could claim it is a significant change and re-visit the earlier approval. This is very unlikely. The reason the tall building is closest to the river is because this was the most valuable location for residences. I do not understand why the labs are not located on the building with the parking garage and keep the tall building as condos. It probably is the result of what the developer could lease first. Maby someone from BP could explain this decision. Creating the RMUD was a rushed process and more thorough work should have had done on it. A lot more specifics could have been added to the zoning of the district, including what you’ve mentioned, “location restrictions”. 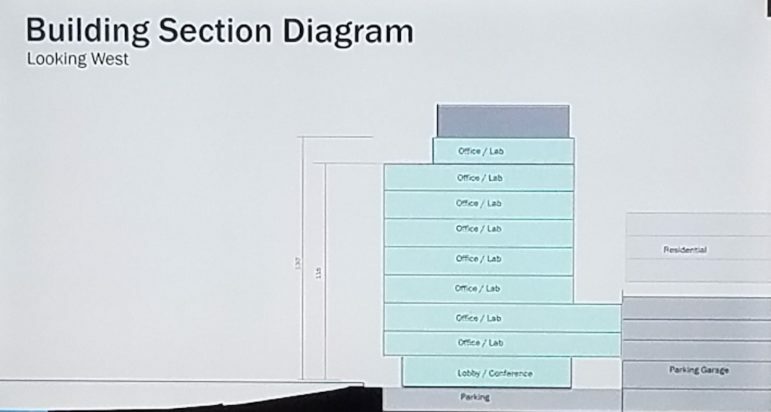 I agree that it would make a lot more sense that the labs be “located on the building with the parking garage”. Regarding “the paths have been redesigned so that fewer trees would be removed compared to the original design”, they could not recall how many trees were to be removed in the previous design and did not know the number of trees that would be removed in the new design. When I stated that I believed it was 12 in the previous design, the response was that it would be that many or fewer, but were not sure of the number. The design was not changed “so that fewer trees would be removed”. I’d also like to comment that it is unfortunate that the $500,000 that Mr. McQuillan had originally claimed would be contributed to the redesign of Arsenal Park is no longer the amount they will be contributing and will be a lesser amount that is still unknown. It would have been helpful if at the time of approval of Master Plan Special Permit, the Planning Department had reached an agreement with the Developer on the amount to be contributed toward the redesign of Arsenal Park. I appreciate all the thoughtful comments above. I too agree that a lab building should not be allowed so close to the river. Not only issues of height and light at night, but also safety and of what must be increased traffic for waste, some of which will undoubtedly be dangerous. Why not have a taller building at the side of the project instead of by the river and Arsenal Park?